An MCFAP candidate in Kaohsiung. When they go to the polls to elect their next president and Legislature later this week, Taiwanese voters will have read a great variety of policy ideas and proposals printed by the Central Election Commission (CEC) on the election bulletin. The electorate will be given three ballots: one for the president and vice president, one for "regional" legislators and one for "national and overseas communities" or at-large legislators. A total of 18 political parties, among Taiwan's 292 officially registered ones, have fielded candidates to vie for 34 "national" and "overseas communities" seats in the next Legislature, according to the Central Election Commission. To win one such seat, a party must garner at least 5 percent of the total valid votes in the national legislative election, which will be held simultaneously with the presidential election on Jan. 16. A total of 113 seats are up for grabs. "Generational justice" -- whatever it means -- seems to be the main opposition Democratic Progressive Party's (DPP's) central appeal to young voters who have complained of low pay and high unemployment, as their counterparts do elsewhere in the world. The DPP, number one on the ballot, also vows to "thoroughly implements transitional justice" -- again a term whose exact meaning few people know but to many local Taiwanese it could mean a transition from "authoritarian," mainlanders-dominated Kuomintang (KMT)-type social justice to "democratic and progressive" DPP-style justice. The DPP also seems to be keen about the word "sustainable," pledging to build a "sustainable, fair and safe" social welfare system and a "sustainable" pension system. After listing a smörgåsbord of slogans covering economy, agriculture, culture, education, national defense, ethnic equality, labor rights and finance, the DPP's last item on its platform column as printed on the election bulletin shows its Achilles heel: cross-Taiwan Strait relations. Vowing to "consolidate free and democratic status quo," the DPP says it will seek to maintain a stable cross-strait relationship and ensure that exchanges between the two sides will go on in an open and transparent way while making efforts to boost Taiwan's defense and diplomatic capabilities. Number two on the list is People First Party, an off-shoot of the KMT. It begins its list of policy proposals by highlighting a role it plans to play in the parliament -- mediating efforts to legislate a law for monitoring all cross-strait agreements including those on trade-in-services and trade-in-goods. To reform the nation's Legislature, the PFP vows to renovate the much-criticized procedure committee, reinstate the power of lawmakers to approve or disapprove the president's appointment of the premier, and push for a transparent operation of the Legislature that would include establishing the parliamentary TV channel. The PFP waves its hand at young people, promising to support new legislation that gives 18-year-olds a right to vote, ease their student loan burden and help them buy their first residence with government assistance. No. 3 on the ballot is Free Taiwan Party (自由台灣黨), which calls for a referendum on doing away with the Republic of China Constitution and advocates the use of "Taiwan" as national title in the international community, instead of the current "Chinese Taipei." Free Taiwan Party vows to write a new constitution focusing on a government run on the principle of check and balance among three branches -- the legislative, the executive and the judiciary -- that it says "suits Taiwan." It will also renew former DPP's Chen Shui-bian administration's efforts to push for Taiwan's re-entry into the United Nations. 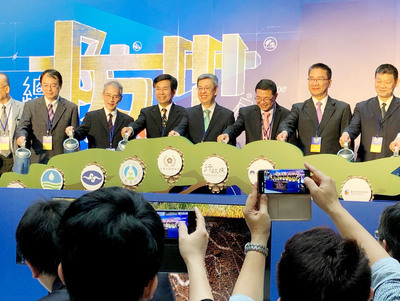 The rarely known party calls for abolishing the Economic Cooperation Framework Agreement (ECFA) signed by Taipei and Beijing in 2010 and ensuing economic pacts to "protect Taiwan's economic self-autonomy." No. 4 is Peace Pigeon Union Party (PPUP, 和平鴿聯盟黨), which pays attention to protecting racing doves and other birds on the conservation list. It promises to hold land and sea races of peace pigeons to raise Taiwan to a level similar to European and North American countries where birds are loved and taken good care of. The No. 5 party, Military Civil Faculty Alliance Party (MCFAP) (軍公教聯盟黨), calls for a fair reform of Taiwan's pension system by seizing all of what it calls the KMT's ill-gotten party assets and use them as a national fund for reforming the pension system and to help less advantaged groups. The party says teachers, public servants, fire fighters and policemen and policewomen should have a right to form their respective unions to help ensure their legal rights and the state should take care of veterans throughout their lives. Composed mainly of retired civil servants, MCFAP promises to streamline the government at all levels and lower the voting age to 18. It also pledges to raise the minimum wage by 50 percent within fours and adjust senior citizens' and farmers' pension in accordance with government revenues.